The company has pulled their promotional ads for their new Amazing Glazes product. Although this ad wasn't intended for commercial TV (we think they just wanted to encourage people to go to their YouTube page for recipe ideas), it is damaging none the less. 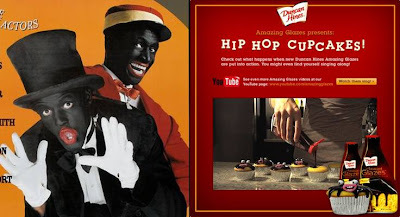 Cupcakes in BLACKFACE!!! Really? Can you imagine an ad campaign on radio for this stuff? There are still places on the Internet where you can watch the video outside of the YouTube site. Duncan Hines pulled the ad after receiving negative reaction to the ad from various blogs over the weekend.